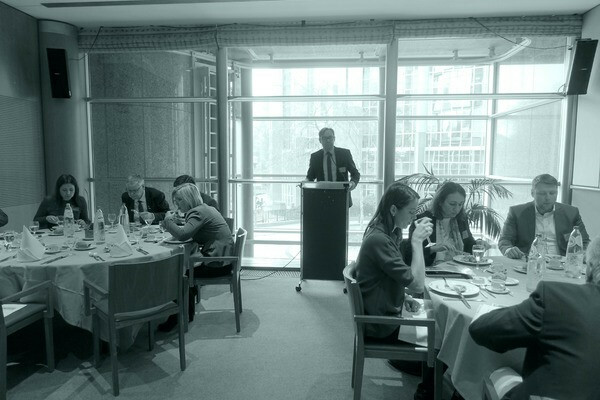 Baltic Ports Organization’s annual Lunch Debate at the European Parliament (5 February 2019), hosted once again by Merja Kyllönen, Member of the EP, was held on February 5th at the seat of the EP in Brussels, Belgium. This year the discussion covered the recent status of Baltic ports within the TEN-T policy and possible future outlook for the period of 2021 – 2027. The budget for CEF II was at the top of the list of items discussed at the meeting. Funding via the Connecting Europe Facility is crucial for many ports, as it presents them with a tangible source of money, allowing them to expand and keep developing, in turn, staying competitive in a very dynamic sector. The Baltic Ports Organization (BPO) has kept a close eye on the allocation process of CEF II funds since the distribution of funding available through CEF I raised some questions for the maritime industry in the region. This year’s debate helped to assess the current position of port-related projects within the budget and put forward recommendations aimed at a more even allocation of financial aids. “Future CEF policy and the Baltic ports are an important issue. How can we deeply connect together energy policy, transport, and digitalization to a wide co-project? We have huge challenges with climate change, decarbonization, circular economy, multimodality needs, and connectivity. Ports can be the leaders and middle cross points in this development. Moreover, for that, we need to understand the importance and meaning of the ports in all our member states and in European policymaking. Ports are the core heart of our transport area and we need to put them on the top of our financing plans too in the world of projects”. In order to help achieve all these goals, the BPO prepared a set of recommendations for CEF II, published as a report last year and available upon request. These touch upon the specific needs of Baltic ports, resulting in part from a variety of unique, regional conditions. The aforementioned needs may be linked to strict environmental restrictions, to which the maritime transport sector in the region must adhere or the comprehensive status of numerous Baltic ports and their importance for sustaining the efficiency of short sea shipping. Both aspects require careful consideration as neglecting them could lead to the Baltic ports becoming less competitive than their counterparts in other regions. “The BPO lunch debate was an excellent occasion to learn the latest developments when it comes to the EU budget for the period of 2021-2027. Baltic ports have been growing steadily over the last years. Some ports will invest in new port infrastructure in order to meet the expected demand. The Baltic ports form together a model port region in terms of sustainability, efficiency, and co-operation, but we also need to be well connected with land infrastructure and comply with high environmental standards. We hope that the future EU budget for transport infrastructure (CEF II) and the TEN-T Policy will facilitate investments in modern and smart port infrastructure”. Other topics broached during the meeting included the role of the EU Corridor Coordinators and their future plans, as well as the main challenges faced by the TEN-T policy in view of its expected revision.